Not ready to commit to a comprehensive strength program? Build this once-weekly workout into your routine to keep increasing poundages. You have been training your typical bodybuilding splits religiously with the type of diligence a Belgian Monk brews his fabled Trappist beers. You have a good physique, people notice and it is clear you train. And while this is all great on the surface, you know you are weak – that your muscle is all show and no go. Don’t you want to be strong? Greater strength, after all, translates to more weight lifted on every other exercise. The conundrum lies in the fact that you love your current bodypart split. And you may even be averse to pure strength training – it doesn’t give you the “pump” you crave, or the same type of muscle fatigue or soreness. 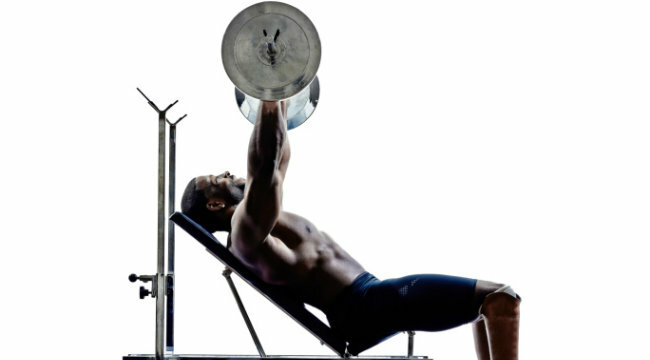 When readers made us at Muscle & Fitness, aware, we came up with a solution. You get to continue your current routine but —drum roll please—we will have one day a week dedicated to strength. Remember, strength is primarily a function of adaptations within the central nervous system. On this day, we want all of the movements to be controlled on the eccentric but the concentric must be as explosive as possible. This is called compensatory acceleration training, or CAT. Muscles and the CNS know tension and force —remember high school physics class? Too many lifters forget the acceleration part—we want nasty speed. Think mind-movement connection, not mind-muscle connection. Perform this routine once a week in addition to your normal body part split to continue adding pounds to the bar on the rest of your bodypart-specific lifts. Not surprisingly, this routine is built on the Big 3 – the squat, bench press and deadlift. Simply perform this routine once a week on the day of your choosing. Looks like you’ll have one less rest day in your weekly split! Rest 3 minutes between sets. The last set can be done for a repetition max to failure if you feel good. Rest 3 minutes between sets. The last set can be done for a rest-pause set if you feel good. To do this, perform as many reps as possible (one shy of failure) then rest 20 seconds, repeat, rest 20 seconds, repeat. Rest 2 minutes between sets. Last set can be done for a repetition max if you feel good.